With all of the hotel and airline program devaluations going on it’s always best to earn as much as possible for all of your purchases. I just came across an offer from Delta SkyMiles Shopping where you can “Shop, Earn Miles And Be Merry”. If you shop through SkyMiles Shopping from now until December 5 you will earn 500 miles for every $125 that you spend. Delta is running the Tap the App Giveaway to spread the word about their new Fly Delta App for iPad. I downloaded the app and took a few minutes to check it out. The app looks really nice and has a bunch of cool, new features. If you don’t have an iPad you can enter by mailing in an entry once per day. This sounds like a pain to me and not really worth the effort but if you’d like to do this find out more at the link below. Open to legal residents of the United States & D.C.
Find out more about the Tap The App Giveaway by Clicking HERE. Enter my contest to win 2 United Club Passes & A United Luggage Handle Cover HERE. Last week I got to attend a couple of awesome Delta events before going away over the holiday weekend. Friday– The opening of the brand new Terminal 4 at JFK Airport. During the opening I got to meet Richard Branson and do what I believe was a first on the Sky Deck. 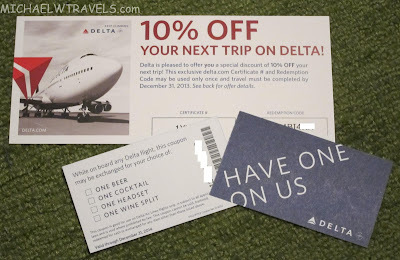 Earlier in the month I was able to get some extra Delta 10% Off Certificates and Drink Vouchers during my visit to T4X. I had asked for them to share with my readers!. T4X was set to close on Wednesday, May, 22, two days before Terminal 4 (T4) opened at JFK Airport. It’s been a very busy last couple of days over here at Michael W Travels. I’m currently in Milwaukee, Wisconsin for Memorial Day Weekend. Instead of packing and planning my trip, I was attending a couple of Delta events. Friday- The opening of Terminal 4 at JFK Airport. Check back for detailed posts about each of those events very soon. I was hoping to get some posts done tonight but my flight to Milwaukee took off over an hour late and when we got to our hotel, Lucas decided to get a second wind and play for a while! In honor of the opening of Delta’s Terminal 4 (T4) at JFK Airport I wanted to do a little giveaway today. While visiting Delta T4X, I was able to get a bunch of 10% off flight coupons and drink vouchers from the friendly staff. I was originally given one flight certificate and two drink vouchers. While chatting with the staff I decided to ask for a few extras to share with my readers. They were happy to oblige so here is the first giveaway. Last month I wrote about a unique way to experience Delta’s new Terminal 4 before it opens at a unique pop-up location in New York City called T4X. T4X opened on May 1 and I had been wanting to stop by but hadn’t had the time. Yesterday I finally got an opportunity to check it out. I had a great time and also picked up some very nice Delta goodies, some of which I would like to share! Preview the new T4, book a reservation, relax, enjoy $4 lunches and random giveaways. I recently received an e-mail from Nina (aka Delta Gold Lass on Milepoint) with a pretty funny sign. While the average person might not see the humor, most of us in the mileage collecting hobby should see the humor here! Nina is a speech language pathologist working with children ages 0-5. Most of them have autism spectrum disorders (I happen to work in the same field as a special educator). She was devastated by Hurricane Sandy, living directly across from the Atlantic Ocean. She is still not back in her condo yet but her saving grace is travel. I wanted to find out a little more about this sign and sent Nina a few questions. MW: Where did you spot the sign? Nina: I spotted the sign along Route 80 in rural central Pennsylvania. MW: When did you spot it? Nina: I saw it on April 19 & 21. I was on the way to a gymnastics event at Penn State with some friends that love gymnastics. MW: What was your reaction when you saw it? Nina: I had to stop and pull over to take a picture because it was hilarious. To me it was hysterical in the eyes of a flying freak. I deliberately wait for Delta fares to drop and then take flights to no where just to accumulate MQMs. MW: How did your friends feel when you decided to pull over? Nina: My companions are accustomed to my lunacy and some have reaped the benefits. They also laughed, seeing my perspective but also rolled their eyes and grinned to bear the detour! I want to thank Nina for sending in this sign and sharing a little about it with us! ***For those that don’t know, a mileage run (according to Wikipedia) is “an airline trip designed and taken solely to gain maximum frequent- flyer miles, points or status”. The new T4 will feature the largest Sky Club including the first Sky Deck, a 2,000 square foot outdoor terrace, more check-in counters, new powered seating to charge your gadgets and some great dining options. I’d love to check out the new T4 when it opens but I’m not sure when I will be flying through there again. Here is another way to get a sneak peek into Delta’s T4 before it opens on May 24. Here is an easy way to earn 500 Bonus Delta Miles for shopping online at the SkyMiles Shopping Mall. This week only, you can receive a bonus of 500 miles when you spend $150 (cumulative) or more at SkyMilesShopping.com.